Over the last decade, the federal government has funneled massive subsidies to alternative energy sources, including wind and solar, ostensibly to reduce carbon dioxide emissions. Yet a recent report by the National Research Council finds that energy-related tax subsidies have had almost no impact on reducing carbon dioxide emissions. The federal government has spent $48 billion on energy-related tax subsidies since 2011, the largest of which was the Volumetric Ethanol Excise Tax Credit (VEETC). The renewable energy production and investment tax credits—most of which go to wind development—decrease carbon dioxide emissions by just 0.3 percent annually, on average, between 2010 and 2035. Taxpayers fork over nearly $250 per ton of carbon dioxide reduced by the PTC and ITC. The VEETC, which expired at the end of 2011, was actually expected to increase carbon dioxide emissions by 4.8 million metric tons (MMT) globally, on average, per year. In total, biofuels provisions raise CO2 emissions by 7 MMT per year. One of the most lavish tax subsidies for alternative energy, the production tax credit (PTC) offers 2.3 cents per kWh for electricity generated from wind, biomass, and geothermal and 1.1 cents per kWh for several other types of energy, including qualified hydroelectric. In lieu of the PTC, alternative energy developers can claim a 30 percent investment tax credit (ITC). About 75 percent of PTC and ITC funds have gone to wind facilities and 16 percent to biomass facilities, according to the report. In 2010 alone, the PTC/ITC cost taxpayers $4.2 billion, constituting about 36 percent of all energy-related tax subsidies. 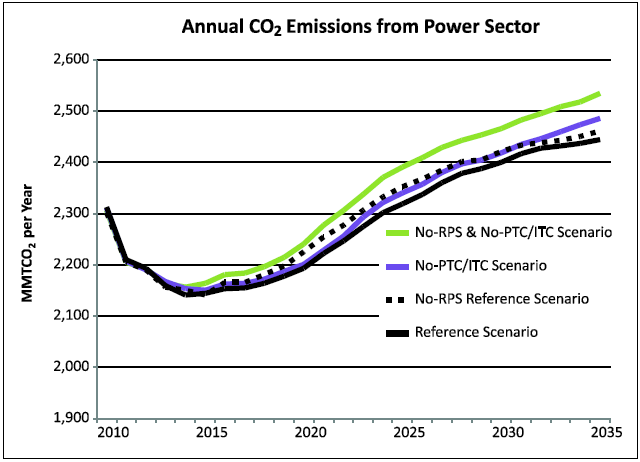 As the following graph shows, despite the exorbitant cost, the PTC and ITC have a minimal effect on carbon dioxide emissions. The largest tax subsidy examined in the report is the Volumetric Ethanol Excise Tax Credit (VEETC). Before expiring at the end of 2011, the VEETC awarded ethanol producers $0.45 per gallon of pure ethanol blended with gasoline. According to the report, VEETC was projected to cost $7.2 billion annually, on average, between 2014 and 2021. For the four months it was available in fiscal year 2012, the VEETC cost taxpayers $3.8 billion. The report also examined the Renewable Fuel Standard (RFS), which requires refiners to blend increasing amounts of ethanol into gasoline. While the RFS is not a tax subsidy, the authors correctly note that it is a key regulatory measure used to subsidize ethanol production. In total, biofuel tax subsidies and the RFS were expected to increase carbon dioxide emissions by 7 MMT per year. The RFS is a flawed policy for other reasons as well, as discussed here. Reducing GHG emissions is one goal for environmentalists who support energy-related tax subsidies. Another is simply to promote the development of alternative energy sources to displace hydrocarbons. But after frittering away billions of taxpayer dollars, hydrocarbons (coal, oil and natural gas) comprise more than 82 percent of primary energy consumption in America and are projected to still make up 78 percent of primary energy use in 2040. In contrast, renewable sources account for just 9.3 percent of U.S. energy consumption, most of which is hydroelectric power that has been installed for years; wind represents only 1.4 percent and solar just 0.22 percent of total consumption. Nevertheless, green energy boosters are wont to offer misleading claims about alternative energy. The wind industry, for example, points out that wind was the largest source of new electrical generation in 2012. As IER explains here, although wind was the number one source of added generation capacity last year, natural gas added 11 times more actual electricity generation than wind. In fact, wind and solar comprised just 3.6 percent of electrical generation in 2012. In other words, tax subsidies for alternative energy are failing at both reducing GHG emissions and displacing hydrocarbons. Tax subsidies distort energy markets by letting the government, instead of regular Americans, pick the winners and losers. By offering tax breaks to politically-favored energy sources, the government creates perverse economic incentives that ultimately harm the American people. IER Senior Fellow Robert Michaels has testified, for example, that subsidies for the wind industry destabilize the electrical grid. While the National Academies report examined only tax subsides, all forms of energy-related subsidies deserve scrutiny. IER’s Federal Energy Spending Tracker provides a comprehensive database of the most significant forms of energy-related subsidies: grants, loans and loan guarantees, and tax subsidies. According to the database, taxpayers have doled out more than $17.4 billion in grants and nearly $54 billion in tax subsidies to energy producers and products since fiscal year 2009. IER also found that the DOE’s loan guarantee programs alone have committed more than $26 billion since 2009 to create just 2,298 permanent jobs—that’s $11.45 million per job. Instead of offering targeted subsidies to specific energy technologies, IER believes that a more effective way to promote economic growth and energy abundance is to reduce marginal tax rates across all energy sectors. IER Policy Associate Alex Fitzsimmons wrote this post.